SAN DIEGO – June 8, 2018, World Trade Center San Diego and a live voting audience awarded $35K to local digital health oncology company CureMatch, as part of the MetroConnect Grand Prize PitchFest. Thank you to World Trade Center San Diego, and the grant awarded by JPMorgan Chase & Co. The real winners are those around the world benefiting from CureMatch’s continued innovation and technology in Precision Medicine developed specifically to help oncology professionals find the best cancer treatments. 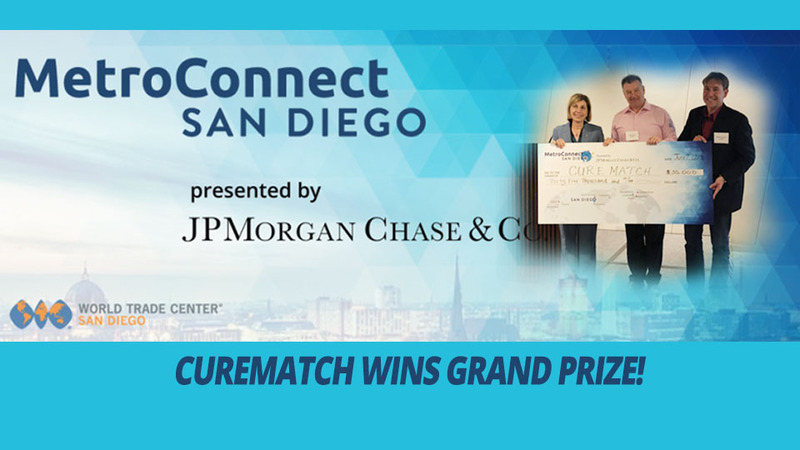 World Trade Center San Diego, through a grant provided by JPMorgan Chase & Co., and more than 100 business and community leaders awarded the MetroConnect Grand Prize to CureMatch, Inc, a local digital health company focused on personalized medicine and oncology. Managed by World Trade Center San Diego, an affiliate of the San Diego Regional EDC, and presented by JPMorgan Chase, the MetroConnect Grand Prize offers $35,000 to one of 15 companies to aid in their foreign market expansion. The finalists competing were CureMatch, FoxFury, Planck Aerosystems and Tioga Research. “CureMatch is thrilled to win the Pitchfest, with special thanks to World Trade Center San Diego and JPMorgan Chase,” said Stephane Richard, Ph.D., president and CEO of CureMatch. For more information about MetroConnect, visit MetroConnectsd.org.